Sidney Giles is one of the more obscure members of the Sherwood Forest Group of writers who met regularly at Richard Howitt’s pharmacy on Lower Parliament Street in the 1820s - 30s. Virtually all we know of him is to be found in Spencer T. Hall’s Sketches of Remarkable People (1873); and on Hall’s recommendation alone I included him in Exploring Nottinghamshire Writers - without ever having seen anything he’d written. Giles must have acquired some education, probably by his own efforts, like Hall. In the late 1830s he sat on the committee of the Nottingham Artizan’s Library, a place where working men could go to read the newspapers and borrow the odd book for a penny a week. He appears to have had his first poem, ‘To the Trent’ published in 1839 in the fourth issue of Dearden’s Miscellany, a monthly literary and scientific journal produced in Nottingham. Alongside much better-known authors, he contributed regularly to the Miscellany until 1841 - about twenty poems in all. By then he had moved to Leicester where in the 1841 Census he gives his address as Regent Street and his occupation “Book-keeper”. Joseph Giles, his son Charles and three daughters, Priscilla, Isabella and Eliza were still living at Windmill Hill at the time of the 1841 Census, but Sarah Giles was in Leicester with her son who was preparing for his marriage to Jemima Cartwright at Gallowtree Gate Congregational Church on 8th June. Whether love, employment or a change of religious affiliation (Sidney and his siblings had been baptised at St Mary’s) caused Giles to move to Leicester is unclear - maybe all three - but there he remained until his premature death in 1846. Spencer Hall recalled visiting the Giles household in Nelson Street. At one literary gathering Sidney read a poem written in memory of his infant son, Charles, who had died in 1843 at 10 weeks, and Hall reproduced this poignant poem in his collection The Upland Hamlet in 1847. His mind earth could not keep in thrall! And we may search the wide world o’er. But not a friend more faithful find. How warm his heart! His wit, how bright! His thoughts, what beams of morning light! A course with so much hope begun! Sidney Giles was buried in the chapel yard at Gallowtree Gate. It is unknown whether Hall’s epitaph ever adorned the grave; the burials were removed to Welford Road Cemetery in 1923 where they are now marked by a single memorial stone. Jemima and the children emigrated to America five years later. Detail of the painting showing where Sidney Giles lived on the right-hand side of the road. At the Research Group meeting on 29 September 2018, Rowena Edlin-White described her study of Nottinghamshire writers with particular emphasis on the Sneinton poet, Sidney Giles (1814-1846). 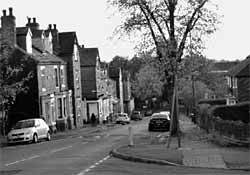 She mentioned that he lived at 21 Windmill Hill, Sneinton in a house since demolished to make way for the flats that comprise part of the William Booth Birthplace Museum in Notintone Place. Windmill Hill has since become known as Windmill Lane. I have an oil painting I inherited from my father showing the view down Windmill Lane with the houses that were there prior to the building of the William Booth Museum and its associated flats. The painting is signed J H BERRY 1932 and has an annotation in my father’s handwriting ‘WINDMILL LANE, SNEINTON, NOTTINGHAM showing Sneinton Church at the end of the Lane and the Wilford Hill in the background. Painted by J H Berry a native of Nottingham.’ Little is known about J H Berry as he does not appear in Henry Cecil Hall’s Artists and Sculptors of Nottingham and Nottinghamshire: 1790-1950 (1953). 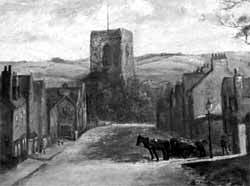 The painting gives Sneinton a very rural appearance enhanced by the horse and cart and the absence of any sign of building on the hillside beyond the church and may convey something of what the village looked like in the first half of the nineteenth century. The scene as it is today (right) shows that the houses on the left are still as Berry saw them, with the Notintone Place flats behind the tree on the right. The houses look as if they may have been built since Sidney Giles’ day.